Internet service provider Comcast and Skype have announced a partnership that will see video calling coming to the HD TVs of subscribers. Skype, the leader in consumer level VoIP (Voice over Internet Protocol) technology, has been playing around with its service being available on televisions for some time now. The problem was that you had to purchase a TV that had it built in to get it going, but it appears that this new deal with Comcast will see it coming to any HD set via a set top box. (our guess is it will work via HDMI cable) Customers who get the device will also receive a video camera and a special remote that will allow them to easily enter text into the interface. 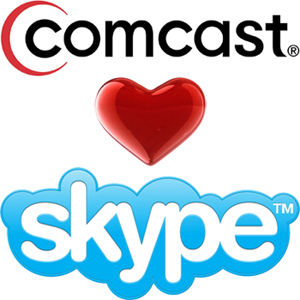 Tony Bates, CEO, Skype, said, “We are pleased to announce this partnership with Comcast. By combining Comcast’s broad living room reach with Skype’s innovative communications platform and worldwide community of users, we can bring video calling into the heart of the home allowing people to share life’s experiences both big and small. Make and receive Skype video and audio calls, or send instant messages via Skype on a television while watching their favorite TV show at the same time, and accept incoming calls during a TV show with the help of Caller ID. Make and receive video and audio calls, or send instant messages via Skype on a compatible mobile phone or tablet. Import friends to their address book from their Facebook, Outlook, Gmail and smartphone contact lists, find them on Skype and see when contacts are online and available to talk. No release date or pricing has been mentioned as of yet. We’d also be curious to know how this will impact any data caps you have on your account. Will they allow Skype to not count towards your total? We doubt it. What do you think about making Skype calls from your TV?